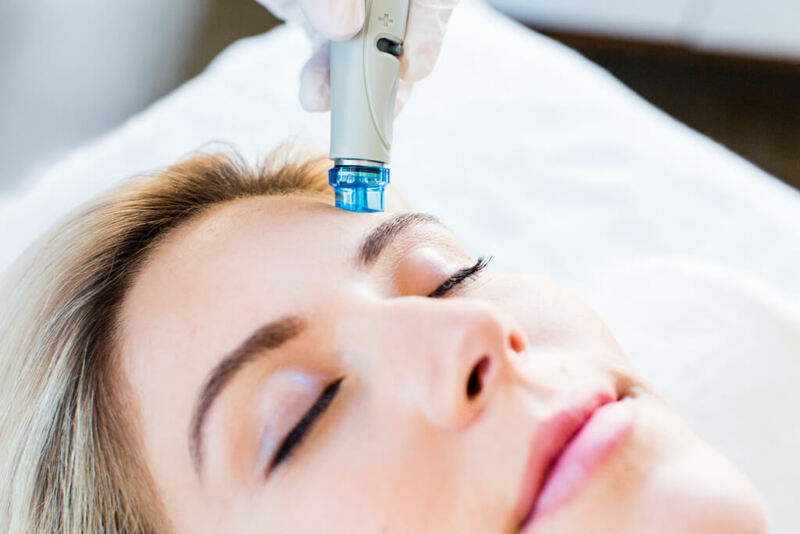 The HydraFacial treatment is a non-invasive treatment that provides instant results for all skin types while having no downtime. The basic HydraFacial is a (30 min) treatment that removes dead skin cells and also extracts impurities. At the same time it infuses the skin with cleansing, hydrating and moisturizing serums. The treatment is soothing, refreshing, and immediately effective. The HydraFacial treatment is appropriate for all skin types, and it is non irritating. Therefore, Even the most sensitive skin easily tolerates the treatment. At Dr. Sean Weiss – Facial Plastic Surgery, we deliver medical grade treatment serums in order to customize the treatment for your unique skin condition and needs. HydraFacial is a fast, efficient treatment that takes as little as 30 minutes. Signature treatments at Dr. Sean Weiss – Facial Plastic Surgery take 60 minutes, thus allowing for infusion of specialty serums and lymphatic drainage massage. You may put on makeup and return to your normal activities right after the treatment. There is no downtime, and there is no pain associated with Hydrafacial treatments. Many clients report seeing visible skin refinement after just one Hydrafacial treatment. The skin tone appears more even and radiant. The smooth result and added hydration last 5 to 7 days. The results improve with treatments performed once per month or every other week. Therefore, those who are serious about their skin and their appearance make it a part of their regular beauty maintenance program. How many treatments do I need to see results? How long do the results last? One treatment per month is the recommendation for improving the appearance of fine lines, wrinkles, brown spots, oily and congested skin. While continued HydraFacial treatments are highly recommended to maintain skin health results. In addition, More frequent treatments are for those who are serious about flawless skin. Hydration is the foundation of healthy, radiant skin while dehydration of the skin leads to increased signs of aging. HydraFacial is a hydrating and non-irritating treatment for all skin types. What Other Treatments are available that compliment Hydrafacial Therapy? Those who are serious about having radiant skin know that a combined approach works best. Much like circuit training, combining treatment modalities greatly enhances results. At Dr. Sean Weiss – Facial Plastic Surgery we harness the power of combination therapy to deliver the best results possible. Learn more about the other treatments and procedures we offer by selecting below.